Published: Sep 11, 2017 · Modified: Apr 12, 2019 · By Jen Sobjack · This post may contain affiliate links. I’m struggling to get going this morning. Monday’s are the worst! Not only are Monday’s bad but this one, in particular, is tough. Hurricane Irma began moving up Florida’s west coast and the destruction has been devastating. I love Florida and was just there two weeks ago for an anniversary getaway. My heart goes out to everyone dealing with the aftermath of this powerful storm. 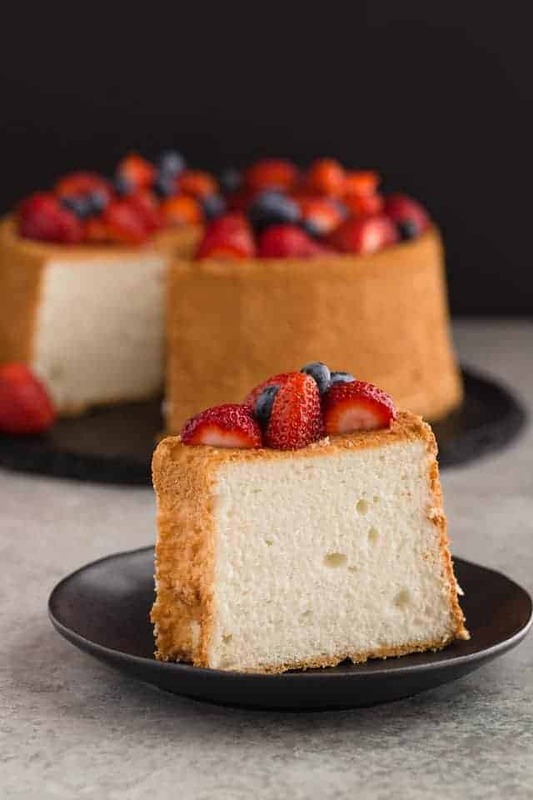 This past week I made the most amazing angel’s food cake. It’s so light, fluffy, and the completely effortless. It’s perfect for topping with fresh berries. 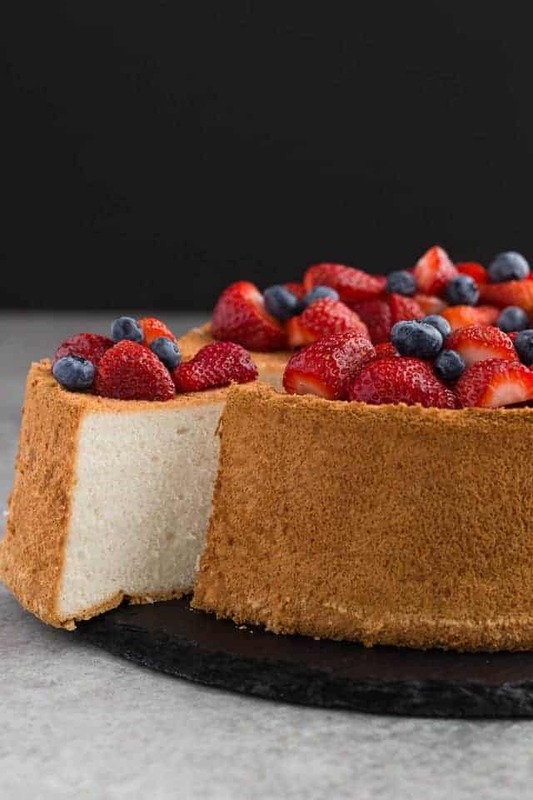 Today’s effortless angel’s food cake comes from Stella, one of America’s Best New Pastry Chefs. She released a book called BraveTart which is also the name of her blog. I’m sure you’ve heard of her. Stella is the queen of no-nonsense baking. All of her recipes are approachable and straight to the point. The book BraveTart is filled with American classic recipes that we all love and each one is made completely from scratch. 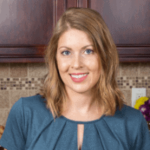 Not only are her recipes completely genius, she also teaches you tips and food history behind each recipe. It’s a must have! Stella’s publisher was kind enough to let me share this wonderfully effortless angel’s food cake with you. The moment I saw how simple it was, I just had to make it. Seriously, you start the meringue with cold egg whites. Who even knew that was possible? All my life I’ve been taught to use room temperature whites. Photograph from BraveTart: Iconic American Desserts by Stella Parks. She adds a little lemon juice to stabilize the whites but the flavor completely dissipates during baking, leaving you with subtle hints of vanilla and a light, fully cake. Stella also uses bleached cake flour and the recipe will not work with anything else, not even homemade cake flour. She explains this in her book and recommends using Swans Down or Softasilk found in the baking aisle. Her technique also calls for under whipping the egg whites. Don’t whip them to stiff peaks. The meringue should have very soft peaks without any foam. This is what gives the cake its light texture. Waiting for the cake to cool is the absolute hardest part of the entire process. This is probably the easiest meringue you’ll ever make. Just put some cold egg whites and sugar in a bowl, start whipping, and then stop before they’re stiff. With a squeeze of lemon for stability, this seemingly under whipped meringue puffs the angel’s food until it’s as light as cotton candy. The lemon disappears in the oven, leaving behind a soft, tender vanilla cake. Because this recipe may present a couple of new techniques for the uninitiated, give yourself room to learn. Like a kiss, angel’s food only gets better with experience. That’s not to say your first time won’t be deliciously sweet, only that half the fun is in perfecting your technique. See photo on page 97. *Key Point: The unique behavior of bleached cake flour is vital to this recipe’s success; unbleached cake flour will cause the angel’s food cake to collapse. Adjust oven rack to middle position and preheat to 350°F. Have ready an aluminum tube pan with a removable bottom, roughly 10 inches across and 4 inches deep. Nonstick pans will not work. If the pan doesn’t have stilts, set out a bottle with a slender neck that will fit into the mouth of the tube. Combine egg whites, sugar, and vanilla in the bowl of a stand mixer fitted with the whisk attachment. Mix on low speed to moisten, about 1 minute, then increase to medium-low (4 on a KitchenAid) and whip for 3 minutes; the whites will look very dense, and dark from the vanilla. Add the lemon juice and salt, increase speed to medium (6 on a KitchenAid), and whip for 3 minutes; the meringue will be light but thin, not foamy. Increase to medium-high (8 on a KitchenAid), and continue whipping until the wires leave a distinct vortex pattern in the thick, glossy meringue, another 3 minutes or so, depending on the freshness of the whites. To check the meringue, detach the whisk; when whipped to very soft peaks, the meringue will run off the wires but retain enough body to pile up on itself in a soft mound. Bake until the cake has risen well above the rim of the pan, with a firm, golden blonde crust, about 45 minutes (206°F). Immediately invert the pan on its stilts, or over the neck of the bottle, and cool upside down until no trace of warmth remains, at least 2 hours. Turn the cooled cake right side up and loosen the outer edges with a metal spatula. Lift the center tube to remove the cake, then loosen it from the bottom too. Invert onto a serving plate; the cake will slide right off the tube. With a chef’s knife or serrated bread knife, cut into 10 or 12 servings with a gentle sawing motion, applying very little downward pressure. Angel’s food is mostly air, so the big slices will be less filling than they look. If a speck of yolk slips into the whites, fish it out with an eggshell. If the yolk can’t be removed, save those whites for Tahitian Vanilla Pudding (page 225) or White Mountain Layer Cake (page 110) and start fresh. Extracts like peppermint and orange, made from essential oils, may cause the meringue to collapse; take care when experimenting with flavorings. In a kitchen below 68°F, cold air may cause the cake to contract and fall from the pan before its crumb has set. As a workaround, open the oven door and place the inverted cake on the stovetop, where drafts of warm air will stabilize its temperature. Through trial and error, I’ve discovered that the highly polished sides of stainless steel angel’s food cake pans may cause the cake to fall from the pan as it cools. For best results, use an untreated aluminum tube pan. Brown Sugar Cinnamon: A cozy flavor for fall, or to end a heavy holiday meal. Sift the cake flour with 4 teaspoons ground cinnamon, and replace the sugar with an equal amount of light brown sugar (dark will not work as well). Chocolate: However angelic its texture, this variation turns out as dark as devil’s food. Reduce the cake flour to 3 ounces (2/3 cup), sifted with 2 ounces (2/3 cup) Dutch-process cocoa powder, such as Cacao Barry Extra Brute. After cooling the cake, use a slender knife or bamboo skewer to loosen it from the center tube too, as this version tends to stick. Creamsicle: Pulse the cake flour with 2 tablespoons orange zest in a food processor for 1 minute. Replace the vanilla extract with 2 teaspoons orange flower water and the seeds from 1 Tahitian vanilla bean (split and scraped). Trade the lemon juice for 11/2 ounces (3 tablespoons) freshly squeezed orange juice. Green Tea: The sweetness of angel’s food mellows the bitterness of Japanese matcha, for a mossy-green cake with an earthy but aromatic flavor. Sift the cake flour with 2 tablespoons matcha (see page 22). I love to serve slices alongside Whipped Chocolate Crémeux (page 263) with a scattering of Cocoa Nib Crunch (page 321). Lemonade: Grinding lemon zest into the flour helps release its essential oil, making this variation particularly aromatic. Pulse the cake flour with 2 tablespoons lemon zest in a food processor for about 1 minute. Omit the vanilla extract and salt. Increase the lemon juice to 11/2 ounces (3 tablespoons). Also lovely with lime juice and zest instead. Roasted Sugar and Vanilla Bean: This is, without a doubt, my favorite way to make Angel’s Food. It’s not my “basic” recipe, because the process of roasting sugar is time-consuming, and not everyone keeps a vanilla bean on hand, but these two upgrades make the cake even more extraordinary. Replace the sugar with 15 ounces (2 cups) Roasted Sugar (page 102). Along with the vanilla extract, use the seeds from 1 Mexican vanilla bean, split and scraped. 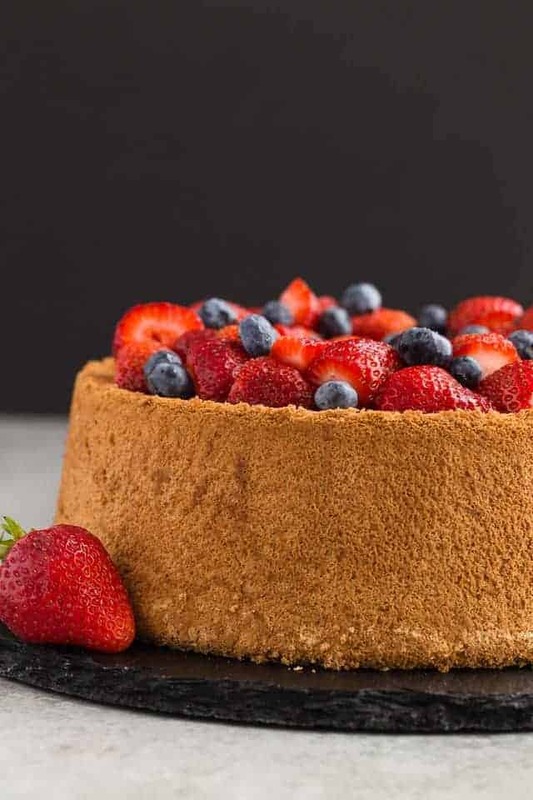 Gluten-Free: Sift 2 ounces (1/2 cup) arrowroot, 11/2 ounces (1/3 cup) white rice flour, 11/2 ounces (1/3 cup) cornstarch, 1 ounce (1/4 cup) coconut flour, and 1 teaspoon baking powder into a medium bowl, then whisk to combine. Recipe and photograph from BraveTart: Iconic American Desserts by Stella Parks. Copyright © 2017 by Stella Parks. Reprinted with permission of W.W. Norton & Company, Inc. All rights reserved. I’ll try to make this recipe, I can do something so perfect, I believe everyone here will love when they see and taste this cake. I bookmarked this book yesterday and is waiting in my amazon cart. The cake looks truly great, and the cold whites definitely got my attention! You won’t regret your purchase. It’s a great book! It turned out so great! I can’t wait to make more delicious recipes from Stella’s book! Can this be made with egg whites from a carton or from powdered whites? I have no idea. It’s not my recipe. I published it with permission from the publisher of Bravetart and I’ve only made it the way the author wrote the recipe.